is a full content management system and so much more through the thousands of plugins and widgets. is a cloud hosting control panel that provides a graphical interface and automation tools designed to simplify the process of hosting a web site. is a content management system is software that keeps track of every piece of content on your Web site. protects and accelerates any website online. Once your website is a part of the Cloudflare community, its web traffic is routed through our intelligent global network. Server Backup Manager is a near continuous backup application for Windows and Linux computers. is the leading Auto Installer having 413 great scripts, 1115 PHP Classes and we are still adding more. MySQL Databases interface to manage large amounts of information on your websites. Many web-based applications (for example, bulletin boards, content management systems, and online retail shops) require database access. Managing multiple email users, business specific email addresses, blocking spam, and creating filters can be a hassle. What cPanel has done is create easy to use tools that enables the website owner to control email from easy to use interfaces. With multiple domains, subdomains, CMS platforms, and users who access the server via FTP; A website owner can quickly become overwhelmed with trying to manage the server. 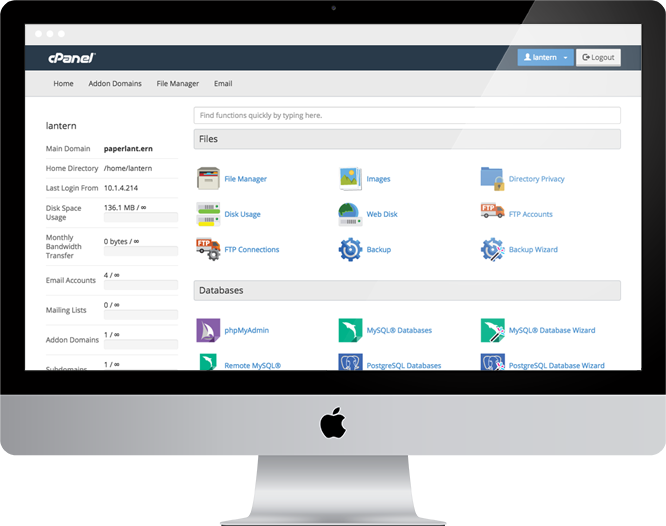 cPanel makes this easy with their File Management tools. Below you will find our web hosting feature list, to insure your requirements are met. If you are a novice in web mastering it may seem a bit complicated. But don't get confused because most likely we support all the web hosting features you'll need to build and manage your site. Having doubts? Don't hesitate to contact our support or sales staff and ask all your questions and concerns we'll walk you through and help you find the best and most affordable web hosting solution for your particular needs.